Vineyard Retreat - Booking For Spring, 2019. Reserve Now! Martha’s Vineyard is a great place to spend your vacation. It has earned a reputation as the place where President’s come to vacation! We have great sandy beaches with clear, pristine water. Martha’s Vineyard, the third largest island on the East Coast, is a 100 square mile offshore island steeped in history and unusual in diversity as illustrated by its six towns, terrain, lifestyle, and people. Martha’s Vineyard has also earned a reputation as an unforgettable wedding destination and a place where celebrity sightings are not uncommon. Yet, Martha’s Vineyard can be private and perfect vacations can still be enjoyed by those of us who are neither Presidents nor celebrities! This picturesque island off Cape Cod remains one of the most popular destinations in New England. Late May and June are a great time to visit the Vineyard! Some advantages to visiting Martha’s Vineyard at this time of the year include easy, no wait access to all of the towns and their stores, theaters, and restaurants and beaches. The summer crowds have not yet arrived so there is not the volume of traffic you will find during July and August. Driving around the Vineyard at this time of the year is enjoyable and something that you can do at your own pace. It is a wonderful time to relax and explore. Parking spots close to your destination as well as getting a dining reservation at the place and time that you desire are also much more available than in July and August. Retired couples have also commented about how relaxing the Vineyard is at this time of the year. In the spring, visitors find ample room for sunbathing. Walking along the seashore is very relaxing and you feel that the views are just for you! Another advantage of choosing to vacation in late May and June is that getting a boat reservation for your vehicle for the day and time that you want is definitely easier than it will be in July and August. As an added bonus, our rental rate during this time is less than our summer rate so, what are you waiting for? At this time we still have great weeks available in May and June. Please call (860) 997-6744 or (860) 997-6844 to inquire about and/or reserve your spring week at our Vineyard Retreat today! Vacation Retreat is a unique, custom-built, well-maintained 1800 Sq. ft. A-frame style house decorated in the mid-century modern style. It is nestled in a wooded setting located on a quiet country road. 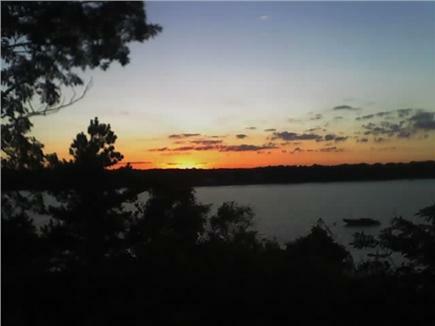 It is in a neighborhood that is perfectly suited for families, active couples as well as retired couples. It is only a short 3-minute walk to Sailing Camp Park where you can enjoy a swim at the beach and view stunning picture perfect sunsets. It only a quick drive (less than 2 miles) or a brisk walk to enjoy all of the activities in the center of Oak Bluffs. Edgartown and Vineyard Haven, with their many shops, restaurants, and attractions, are also very easily accessible. For those not bringing a vehicle to the island, it is helpful to know that there is a Vineyard Transit Authority bus stop at the end of our road. The three bedrooms comfortably accommodate 6 people. 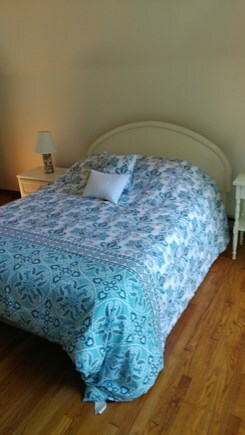 The master bedroom, with its queen-size bed, is located on the first floor. 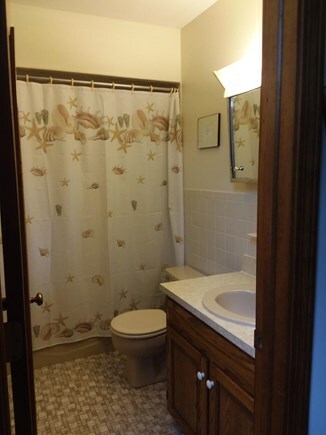 It has an attached full bathroom with a large private shower. Two additional bedrooms are located on the second floor. One of the upstairs bedrooms has a queen bed while the other has two twin beds. There is a full bath on the second floor that serves the two upstairs bedrooms. One of these bedrooms has a private outside balcony. Many rentals require you to bring your own linens, blankets, and towels which is just more for you to have to pack to take with you and then take back home. We provide all of the bed linens, house blankets, and house towels. The fully equipped kitchen opens to a cozy dining area and a living room that provides direct access to a spacious deck. A fully enclosed outdoor shower, with hot and cold water. This shower is available to rinse off or shower in after returning from an enjoyable day at the beach. 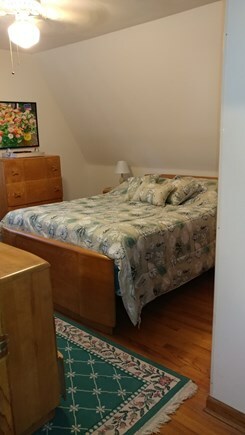 Pictures of the inside of Vacation Retreat can be seen at http://www.blufin.net/mj.htm. (Hit control then return to get to this site). This slideshow is an older one that we anticipate replacing soon but it shows all bedrooms as well as other rooms in the house. The location of Vineyard Retreat provides easy access to the State Forest bicycle path as well as bicycle paths leading to Vineyard Haven and Edgartown. Our location also provides easy access to golfing at Farm Neck (.5 miles), swimming at State Beach (3 miles) and to other down-island saltwater beaches as well as to all other island towns and attractions. Unlike other locations in Oak Bluffs, and, in particular, many locations in Edgartown and Vineyard Haven, you can rest assured that you will not be faced, on a daily basis, particularly throughout the summer months, with having to merge into a long line of stop and go traffic when leaving our house in order to get to your destination. So, what are you waiting for? Call (860) 997-6744 (Mike), (860) 997-6844 (Mary Jane) or our home phone (508) 693-9863 to reserve our A-frame Vacation Retreat for your vacation! If you are INTERESTED in the fall weeks still available you are in luck! The price for these weeks has been reduced to $1800 per week. Call soon to reserve your week on Martha’s Vineyard and get the vacation of your dreams at a price you can afford. If you have additional questions and prefer the Internet, please contact us via the email link above. A $500.00 Reservation/Security REFUNDABLE DEPOSIT is required for all rentals. This deposit is refundable after inspection of the property and within 5 weeks after the rental period. Sorry, pets of any size or kind and smoking are NOT allowed. If you need a place to board your pet on the island, please contact us for further information. The Regan family had a fantastic time here on the Vineyard. This was our first family trip and we couldn't have had a better time! We look forward to making this a yearly vacation – See you soon! Michael & Dianna Regan & family, Watertown, CT. I can’t imagine staying anywhere else when I come to visit MV! Thank you very much. Michelle Mills, Derby, CT. This was a great week! We loved your home – very comfortable and accommodating. Really enjoyed and appreciated your kindness and generosity. Thanks again for everything. “You’re the best.” Marge and Kathy Kuhar, Venice, FL. It was our first time on Martha’s Vineyard and what an awesome time we had! Thank you, Mike & Mary Jane, for opening your home and your hearts. Sailing & clamming was great! Hitting the yard sales yesterday made the week! The Sanzo family, Newington, CT.
We had another fantastic vacation thanks to you! The weather was awesome! We think of this as a home away from home! Mike, you’re the best when it comes to picking the right beaches and activities. Can’t wait until next year! Love you guys! The Vertucci’s, Wallingford, CT. This was our first family vacation with our 7-month-old baby. The Vineyard was the perfect place to go – so relaxing! Thank you for opening your family home to us. A special “thanks” to Mike for all of the tips and directions. We had a wonderful time and will have fond memories. Thanks again, The Veillette’s, Torrington, CT. Thank you so much for welcoming us into your home. Our stay here was wonderful. You and your family have a great home. We really appreciate your hospitality. You helped us to enjoy some of the best treasures of the island! Our stay was wonderful and we hope to be back next year! The Dixon’s, Alexandria, VA. 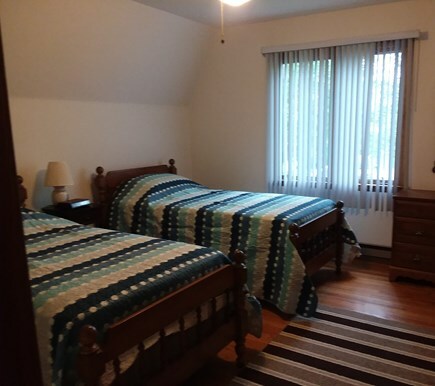 Long-Term Rental (1 month or more): This house is available for weekly and/or monthly rentals in June and September but is not available as a long-term winter rental. Additional pricing info: Monthly rentals for June and September - $7000.00/month. State and local taxes of 11.7% will apply. No matter which entrance is used, in order to enter this house, there are three steps. For this reason, this house should NOT be considered as being handicapped accessible. A-Plus stay in the A-Frame House! 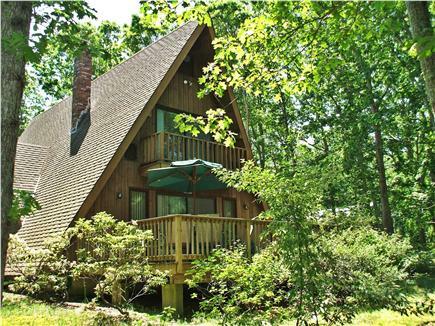 If one floor living is important to you—the A-frame is perfect. If room for the family is important to you—the A-frame is perfect. If an extremely well equipped kitchen, plenty of towels and linens and a spotlessly clean house are important to you—the A-frame is perfect. If grilling and enjoying a deck are important to you—the A-frame is perfect. If a peaceful getaway that is only a few minutes drive from beaches, restaurants, and the harbor is important to you—the A-frame is perfect. Our family had a great experience on our vacation. The house was comfortable and clean and in a good location. We would love to have you return to our home in the future but fully understand that you usually rent a larger home that will accommodate your family as well as your friend’s family. On our recent trip to Martha's Vineyard we rented an A-Frame home from Mike and Mary Jane that was clean and roomy with easy access to Vineyard Haven, Oak Bluffs, and Edgartown. The owners left a list of things to do that proved very helpful in making the most out of our time on Martha's Vineyard. We truly enjoyed our stay and would recommend it to other families. Property was very clean and well maintained. Property owner is available if there are any questions or issues that arise. Location is very convenient to both Oak Bluffs and Vineyard Haven. Bedrooms are good sized and the kitchen is well stocked with pots, pans, dishes, etc. Outside shower was handy. Quiet neighborhood and nice yard. We will definitely be returning to this property in the future. This home is located about a mile outside of the main attractions of Oak Bluffs. You get to enjoy the quiet feel of being outside of town, but have the ability to get to the attractions in no time. After our second year at this home, we really have fell in love with the Vineyard. The owners know all the ins and outs of the island and are the best tour guides you can find. Mike and Mary are great people that love welcoming others into their home. We can't wait to go back next summer. "If you're fond of sand dunes and salty air" This A frame in Oak Bluffs will take you there. We belong to a Sunday evening dinner club that has been meeting for over 30 years. We were considering renting a Villa on the Amalfi coast several years ago, and decided to find a place nearby to CT to work out the logistics of coordinating the needs of 6+ people and also being able to continue our culinary traditions. We selected this wonderful property belonging to friends and colleagues Mike and Mary Jane, and the rest, as they say, is history. We have returned here for the last seven years, and never did get around to the Amalfi coast. 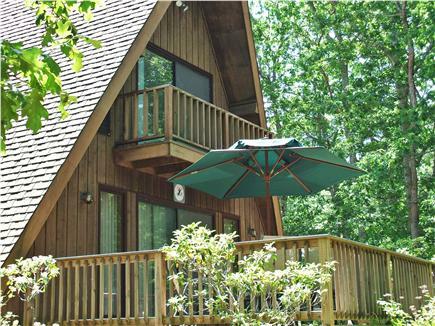 The place is spacious for 6 people, has great amenities and all the attractions that summer on the Vineyard can offer. Mike and Mary Jane are superb hosts and except for a few rainy days, we have zero complaints in all that time. The house is close enough to beaches, bike paths, boating, and restaurant options for easy access, and far enough away to enjoy peace and quiet if you just want to "vegge". Try it, you'll like it. Just don't ask for our week.